These units have been an AV workhorse for many years due to their brightness, robust build quality and quite operation. They are XGA resolution and offer 6000 lumens. Perfect image quality, high brightness and an emphasis on reliability are the characteristics of the PT-D5700E. This is guaranteed by the high quality DLP technology in combination with the BriteLite two lamp system. The PT-D5700E works with two independant ballast units each driving one lamp securing a maximum of fail safe. The integrated liquid cooling system allows to seal the optical block completely. This allows the usage of this projector in every kind of smoky or dusty environment without performance drop. It is also designed to work in temperatures of 45degrees - avoiding the need of additional cooling in most circumstances. The PT-D5700E delivers bright 6.000 ANSI Lumen brightness, XGA resolution and a very high contrast ratio of 2.000:1. The projector allows to display HDTV content. Additional to digital inputs it allows a lot of other AV connections. Also a RS323 or LAN based control and monitoring of the projector is possible. And weighing only 13.9 kg it is a real lightweigt in its class making it simple to handle for rental and staging activities. The centrally mounted lens offers a maximum in flexibility for all kinds of installations. Electrical as well as manual adjustment possibilities allow for sharp image reproduction. For the different projection distances a wide range of exchangable lenses are available. 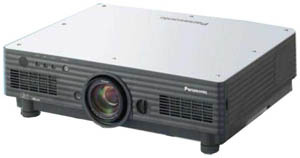 This projector is part of the 2008 Panasonic range. With built-in edge blending its very popular with theatre users.